The size is not a big size, please read the size chart in the product description carefully ,if you are not sure of the size, one size up is a good idea. 100%cotton. Classic and iconic style that will never be out of fashion . This swing dress has a really full circle skirt . 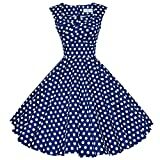 Get the full 50’s look (as in the main picture) by wearing with a 22″ length petticoat, available to purchase separately. Petticoat not included.